FRIGIDAIRE FAQE7001LW Affinity Classic Front Load Electric Dryer 7.0 Cu. ft.
Because of its 7.0 cubic capacity, the FRIGIDAIRE FAQE7001LW electric dryer can help the consumer dry more at one time. However, the dried laundry is not disheveled and wrinkled despite the combination of fast cycles and heavier loads thanks to DrySense Technology. Also, despite the heavy loads and optimum performance, the dryer does not make noise because of SilentDesign technology. The combination of DrySense and Wrinkle Release technologies produces precision drying and wrinkle reduction. DrySense technology ensures the efficient drying of the garments according to the userís desired dryness level while reducing the creases on the garments. Wrinkle Release technology focuses more on reducing those creases/wrinkles. TimeWise Technology reduces the time that the user has to wait to get dry, wrinkle-free clothes. Such a feature is important to households that have loads of laundry to dry. SilentDesign technology creates some peace in the laundry area by preventing noises and vibration to emit from the FRIGIDAIRE FAQE7001LW dryer. Quiet operation reduces some of the stress in performing household chores. An electronic Moisture Sensor is included in the design of the FRIGIDAIRE FAQE7001LW. This sensor helps in achieving the specified dryness level by detecting the amount of moisture present in the load. The knowledge achieved will then be used in preparing the right conditions for the load. The FRIGIDAIRE FAQE7001LW dons Express Select Controls. The user can just press a button to make a selection. Starting a cycle requires the same thing ñ just a push of the button. On a whole, the product is easy to operate. The reversible door allows easy maneuvering and easy installation. This space-saving feature allows the door to be opened to the direction of either of the two main directions. Changing the position of the door takes only a few minutes. The dryer is also stackable with a matching washer. This way, the user does not have to find extra space for the additional appliance. 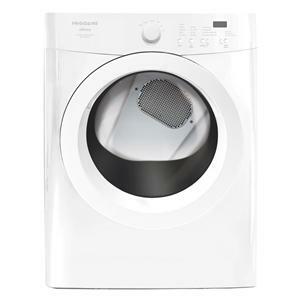 The main exterior color of the FRIGIDAIRE FAQE7001LW dryer is Classic White. Buyers who prefer something a little different will be able to find a dryer with the exact roster of specifications will be happy to know that such a dryer is also available in Classic Black. The drum has a 7.0 cubic feet capacity that allows the user to finish several loads or one heavy load in a short period of time. This painted drum is built to last. The FRIGIDAIRE FAQE7001LW dryer has several space-saving features that allow it to be added into most laundry areas without the need for the owner to have expensive extensions built. There are many features that work together to preserve the quality of the fabrics. The dryer helps in reducing ironing time by reducing the number of wrinkles. The dryer is not Energy Star rated.